Jack Palance is one of those actors who has been around for so long and has been seen in so many varied projects, that when he dies, every type of entertainment publication feels compelled to run his obituary. 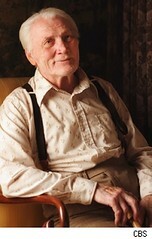 Palance died today of natural causes in his California home. He was 87. Palance is probably best known for his long career playing tough-guy roles in movies like Shane and City Slickers (for which he won an Oscar and did those one-handed pushups at the ceremony). But TV fans will likely remember him as the host of the show Ripley’s Believe It or Not, which ran from 1982-1986 on ABC. God, was it creepy when he ended one of those segments about someone with two noses or some other equally freaky subject by slowly saying in his calm, low tone, “Believe it… (inhale) or not.” Gave the teenaged me the willies. But I tuned in each and every week. Gonna miss the guy. As for me, when I lived in Tamaqua, PA, I was often told of how people would run into Palance on the streets of Hazleton, PA (about 10 miles north of Tamaqua, and supposedly his hometown). Every story spoke of how down-to-earth and friendly Palance was. I never met the man myself, but I will always think of him in connection with his role as Curly in City Slickers. In particular, I remember the conversation he had with Mitch, played by Billy Crystal, as they rode through the western countryside. Mitch and two of his New York buddies have come to northern New Mexico to work through their mutual mid-life crises by driving cattle up to Colorado. But Curly can only shake his head at their angst. “You city folk! You spend 50 weeks a year getting knots in your rope,” Curly uncomprehendingly observes. “Then you think two weeks up here will straighten it out.” The horses pause beneath them. “Do you know what the secret of life is?” Curly asks Mitch. “No, what?” Mitch asks eagerly. “This,” Curly answers holding up one gloved index finger. “Your finger?” Mitch asks, thrown off a little. It’s a memorable scene, and not just because it’s good filmmaking. One person has called this conversation “an ink-blot of cowboy spirituality. Curly is the Zen master of the old west. You read anything you want into it.” But this still leaves us asking, “So what is the one thing?” Is it low carbs in your diet? Is it a blockbuster Eagles or 76er or Phillies trade? Is it getting your kids into the best schools? Just to demonstrate something that some of you already know – that my mind operates in weird ways – this scene from City Slickers reminds me of something a friend once shared with me from the 19th century Danish theologian Soren Kierkegaard. Kierkegaard begins his book Purity of Heart Is to Will One Thing with a prayer. What is a man without Thee! but a chipped fragment if he does not know Thee! Thee the One, who art one thing and who art all! to the will, purity that wills only one thing. in suffering, patience to will one thing. give to the young man the resolution to will one thing. I don’t know if Palance possessed “a life that willed only one thing,” but I do know that one scene in City Slickers has helped me over the years to focus on what that idea might mean for me in my life. For that, I am grateful, and I wish Mr. Palance “God Speed,” and I pray that he might find rest in the arms and love of God. Posted on November 10, 2006 December 7, 2014 by WPosted in Life in General, Soren KierkegaardTagged Billy Crystal, City Slickers, Jack Palance, One Thing, Soren Kierkegaard.